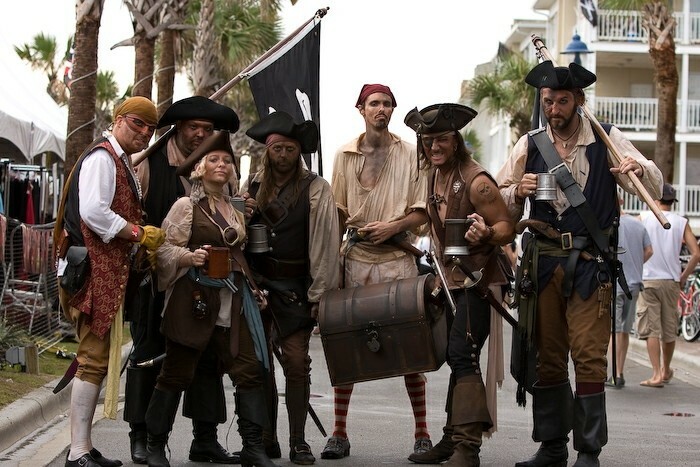 THE Tybee Island Pirate Fest is a four-day festival with live music, a parade and family-friendly activities. The hub of pirate action is at the South Beach parking lot, located on Tybrisa Street. Whar be the startin' point, Matey? The Fest begins Thursday, October 8 at The Crab Shack with the coronation of Pirate Fest's King and Queen, Lanny and Stacye Jarrell, at the Buccaneer's Ball. Arrr, what can we plunder the rest of the weekend? Friday, Saturday and Sunday highlights include The Pirate Victory Parade with the monster truck "Big Foot", Scallywags Costume Contest, Little Matey's Cove, Thieves Market, the Bud Light Whatever Bar with live music, a fireworks show and several kids' activities such as a petting zoo, carousel, the Sea Ray swinging pirate ship ride and a 90 foot tall Ferris wheel. Tell me about the music or you'll be walkin' the plank. This year's headliners are Big Engine and Junior Marvin's Wailers. Big Engine is a popular local band that will headline Friday, October 9. Junior Marvin and the Wailers, a blues/rock band whose lead singer, Junior Marvin, has performed with Stevie Wonder, Bob Marley, and OAR will take the stage Saturday, October 10. Sapphire Bullets of Pure Love, a native Savannah band, will be the closing act taking the stage at 9:15 p.m. Friday, October 9. This 13-piece band includes the five-member "Bonaventure Horns" and covers the likes of Frank Sinatra, Prince, Otis Redding and The Rolling Stones. Aye, but the pirate favorite is sure to be the Kiss cover band. MiniKiss, a cover band that performs songs from Kiss and other 80's bands will take the stage Saturday, October 10. This act, composed entirely of little people, appeared in Mall Cop 2, the Dr. Pepper/Kiss Super Bowl commercial, "The George Lopez Show" and "Gene Simmons Family Jewels."